I’m purchasing an Xbox Live Indie Game every day, seeking out the quality titles that got lost in the shuffle and are not well represented in the top 50 lists on the Xbox Dashboard. Today is day #116, and today’s game is “Coral’s Curse”. 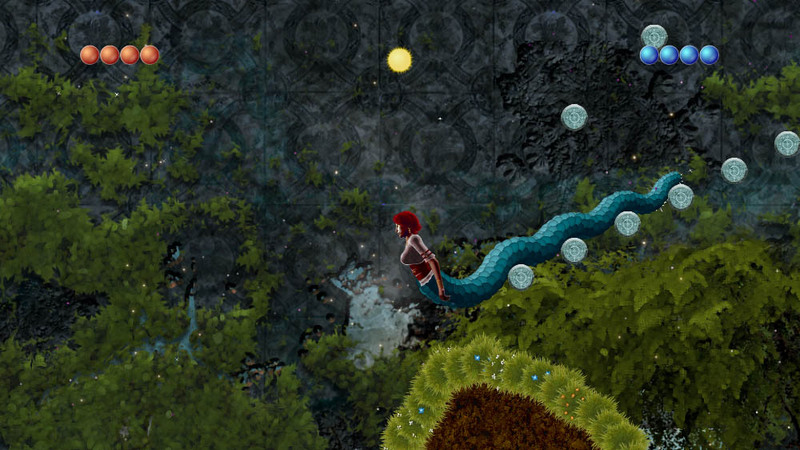 Not a traditional platformer, more a puzzle/actioner, Coral’s Curse is a great game. It stumbles on occasion but still provides fun and innovation. As a bonus, it just dropped in price from 240 Microsoft Points to 80 MSP, cementing it as a must buy. Coral’s Curse is listed as a platformer on the Xbox website, but the label doesn’t fit the game well. This is no Super Mario Bros., this game has you slithering about on the ground or on floating pegs and blocks. There’s no running and jumping here. Your challenges aren’t reaching far-flung platforms, but mastering the movements of your tail to defend yourself against enemies and anything they may fire in your direction. The tail is the best and the worst of the game. It opens up new and innovative gameplay elements, and for the most part it co-operates, but occasionally in tight areas it can actually get in your way. However, the first time you use it to keep you steady as you lean off of a platform, or hook it on something to solve a puzzle, all is forgiven. If one enemy is controlling your tail in cramped quarters, then lava is another: it takes a toll on Coral’s health and can kill her, forcing you to restart. While you have unlimited lives, losing some of your progress in a game that’s all about puzzle solving is not fun. It is possible to expand your life meter by seeking out red orbs, and by healing your life force with hearts interspersed throughout the level, but trying to cross even small lava pools will remain treacherous. The game features underwater tunnels and tracks of vines to allow you to transport your character about the world, but there are times when Coral will have to burrow into the Earth to form passageways to otherwise unreachable areas, or treasure/power-ups, which is an element that felt pretty unique to me. To help you along you can acquire mana orbs that allow you to fire more frost and fireballs to eliminate opposition, and there are other upgrades to your character as well. Some power-ups seemed to be decorative in nature, and there are coins in the game which also seem to serve no purpose no matter how many of them you collect. The one thing about the game that did remind me of traditional platformers was seeking out keys to unlock doors. The game has a strong focus on exploration, and I like that in a game like this. In the end it feels a bit more like an action/adventure to me than a platformer. The art is perfect for the game, and some areas have real wow factor. The animation is excellent, as well, aside from Coral seeming like an automaton from the waist up. With lots to collect, but the ability to ignore most of the collectibles if that’s not your thing, the game strikes a good balance between those who want to complete the game in a hurry or those that want to collect everything on offer. The story is nearly non-existant, and some tweaks to the level design could improve your characters navigability through a few tight spots, but aside from those niggles this game has a lot going for it and is a must buy at its new low price. For a second opinion, check out Kobun’s review of Coral’s Curse.